The genus Dracophyllum Labill. (Ericaceae) has a fragmented distribution in Australasia, but reaches the greatest level of species richness and morphological diversity in New Zealand. We investigated evolutionary processes that contribute to this disparity in species richness by comparing DNA sequences from members of Dracophyllum, its close relatives Richea Labill. and Sphenotoma R. Br. ex Sweet (together constituting tribe Richeeae Crayn & Quinn), along with more distant relatives in the Ericaceae. We created complementary data sets for the chloroplast-encoded genes matK and rbcL. Parsimony, Bayesian, and maximum likelihood analyses were conducted to assess the robustness of our phylogenetic inferences. The results were largely congruent and, when analyzed in combination, provided greater resolution. In our analyses, tribe Richeeae formed a monophyletic group that diverged during the Eocene (at least 33.3 million years ago [Ma]) with a crown radiation during the Early Miocene (at least 16.5 Ma) that resulted in two disjunct lineages. This date corresponds roughly to the onset of aridification in central Australia. 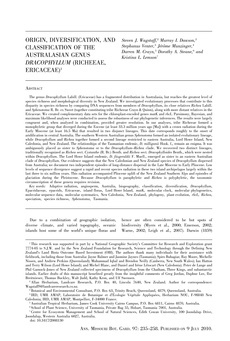 The southern Western Australian genus Sphenotoma formed an isolated evolutionary lineage, while Dracophyllum and Richea together formed a second lineage restricted to eastern Australia, Lord Howe Island, New Caledonia, and New Zealand. The relationships of the Tasmanian endemic, D. milliganii Hook. f., remain an enigma. It was ambiguously placed as sister to Sphenotoma or to the Dracophyllum–Richea clade. We recovered two distinct lineages, traditionally recognized as Richea sect. Cystanthe (R. Br.) Benth. and Richea sect. Dracophylloides Benth., which were nested within Dracophyllum. The Lord Howe Island endemic, D. fitzgeraldii F. Muell., emerged as sister to an eastern Australian clade of Dracophyllum. Our evidence suggests that the New Caledonian and New Zealand species of Dracophyllum dispersed from Australia; we document two independent episodes of long-distance dispersal in the Late Miocene to Early Pliocene. Low levels of sequence divergence suggest a rapid and recent species radiation in these two island archipelagos largely within the last three to six million years. This radiation accompanied Pliocene uplift of the New Zealand Southern Alps and episodes of glaciation during the Pleistocene. Because Dracophyllum is paraphyletic and Richea is polyphyletic, the taxonomic circumscription of these genera requires revision.